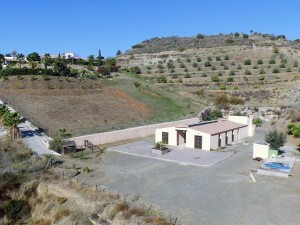 A very well presented & spacious 3 bedroom, 3 bathroom semi-detached Villa which is ideally located on Alhaurin Golf. 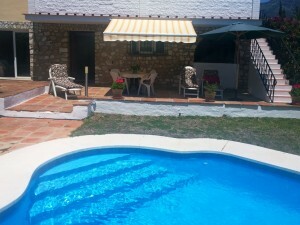 This stylish family home with stunning mountain views offers excellent year round holiday/long term letting potential. It is ideally located for golfers and is easy accessible to the beach resorts of La Cala de Mijas & Fuengirola. Golf courses namely Santana, Mijas Golf, Lauro Golf are all within a short drive away, so plenty to choose from. The villa is accessed through automatic wrought-iron gates having a lovely lawned front garden with an attractive stamped concrete driveway with at least three secure parking spaces. At the front of the villa is a sunny terrace area where you can just sit and take in those stunning mountain views. At the side of the property is a purpose built carport. On entering the villa you will find a spacious hall with fully tiled cloakroom complete with shower cubicle & a very useful storage cupboard. From the hallway there are two doors opening up into the spacious lounge and dining room having two patio doors opening out onto the terrace and garden. The hall leads directly into the extensively fitted kitchen and breakfast room having a vast range of appliances with breakfast/dining area. A door leads directly out onto a large private rear terrace with plenty of room for outdoor dining & sunbathing with a very welcoming pool having lights to enjoy your midnight dip. There is an easy maintainable lawned area, ornamental wall with attractive flowers & shrubs having an automatic irrigation system. There is also a brick built BBQ with useful storage room. Upstairs you will find a spacious Master bedroom having built-in wardrobes and patio doors leading onto the lovely terrace with far-reaching views to the mountains and countryside. Off the Master bedroom is a full en-suite bathroom having bath with shower over & vanity unit. There are a further two double bedrooms, the second bedroom having a Juliet balcony with views to the mountains and the third having views of the garden & pine forest to the rear. Both bedrooms having plenty of built-in wardrobes. Alhaurin el Grande (5 min drive) where you will find plenty of bars, cafe's & restaurants, shops & supermarkets. The beautiful white washed village of Mijas (10 min drive). Here you will find the true Spain as you wonder through the narrow cobbled streets of this Andalucian village with it's vast array of bars & restaurants some with breathtaking views to the coastal resorts. La Cala de Mijas (20 min drive) is one of the original fishing villages having a lovely golden sandy beach. A charming village with a friendly atmosphere and lots of appeal, it is very popular with many good restaurants, shops and beach-front bars & restaurants having a twice weekly market. The larger & busier resort of Fuengirola is also a 20 min drive away ideal for families and children with a fantastic offering of beach, facilities and activities. Málaga International Airport is just a 25-30 minute drive away.